an interdisciplinary initiative on aging and the built environment at the University of Kansas. In 2010 real estate developer Lee Foster posed the question, “What kind of residential housing and life style will baby boomers want when they retire?” His question was timely because 10,000 boomers turn sixty-five every day now. Boomers, by their sheer numbers, have changed the norm for every age they have passed through and no doubt will change the norm for our post-career lives, too. But what do they want? with his granddaughter, Pippi Simpson. Our investigation has led to colloquia, seminars, classes, and design studios at KU. We have published New Cities, a book of students’ designs for intergenerational housing and post-career homeplaces. We established the Boomer Futures Think Tank featuring leading authorities on gerontology, demographics, sociology, psychology, health care, environmental studies, law, architecture, design, transportation, and engineering. We tap the knowledge of business people who are developing products and services at an astounding rate in response to a growing market driven by boomers' needs and expectations. We work closely with the City of Lawrence and Douglas County, Kansas, toward creation of Campus Village, a new intergenerational community that will not only meet boomers’ retirement needs, but also attract all age groups. We also support Eastside Village Lawrence, a nonprofit organization dedicated to helping East Lawrence residents age in place with support of neighbors. What have we learned about boomers and their residential choices, should they move from their current homes? They want to be close to nature. They want walkable cities and good public transportation. They reject the idea of age segregation, and want to be close to their children, grandchildren, and friends. They want affordable housing with progressive architecture and barrier-free design. They like to use technology and want a learning community. Weather is not as important to them as the climate of a place. They want to serve their communities and mentor youth. They support sustainable communities. They want to leave a legacy and live meaningful lives. Those who participate in and contribute to this initiative are too numerous to mention in this brief welcome, but if you explore our web pages, you will meet them. Please send us your thoughts. The New Cities Housing Lab is in collaboration with Build Smart, LLC to investigate prefab housing at KU's East Hills Construction Innovation Lab. 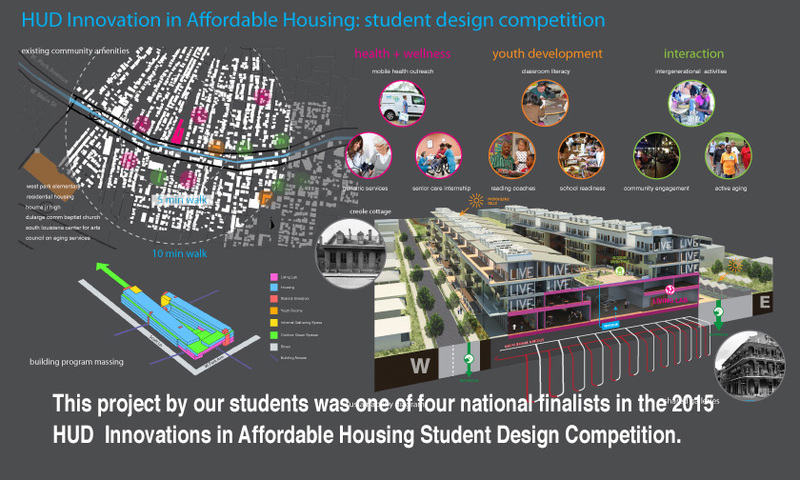 Students Leigha Sledge, Katie Beckwith, Shima Safarnezhad, and Alex Frost, all members of the New Cities Housing Lab, recently took 2nd Place at the 2015 AIA Central States Student Design Competition. Recent initiatives by the New Cities Housing Lab were featured in the Lawrence World Journal on August 23, 2015. New Cities researchers Dr. Dennis Domer, Emeritus Professor, Joe Colistra, Associate Professor, and Dr. John Shreve, a Principal with Populous, traveled to St. Louis in June to conduct planning workshops in collaboration with Keystone Technologies. The KU’s New Cities Housing Lab Studio was one of four finalists in the 2015 HUD Innovations in Affordable Housing Student Design Competition. Dr. John Shreve, a Principal with Populous, and Associate Professor Joe Colistra presented recent work of the New Cities initiative at the Environments for Aging Conference in Baltimore, Maryland in April 2015. Associate Professor Joe Colistra, a researcher with KU’s New Cities recently had a senior housing project win two awards. The High Mar Senior Housing project in Boulder, Colorado was named the 2014 “Best Affordable Housing Project” by Senior Housing News. It was also named “2014 Best Built Project” by the Colorado Chapter of the Congress for the New Urbanism. Dennis Domer, former New Cities Long Life Initiative director has an article published in the second issue of the on-line magazine, *Seniority*. USA Today's July 15, 2014 issue included "Aging adults optimistic about what lies ahead." 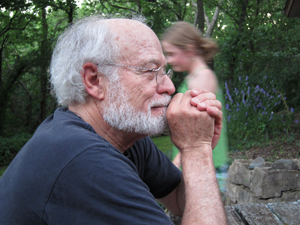 Dennis Domer was one of the elders interviewed for the article. Caring.com provides online information and support for caregivers of aging parents, spouses, and other loved ones. Caring.com’s mission is to help the helpers make better decisions, save time and money, and feel less alone.